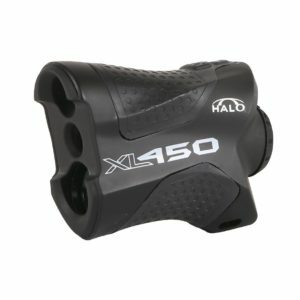 Halo XL450, an affordable option, ideal for those who don’t want to spend too much on their first golf rangefinder, as well as those who want to have a reliable backup handy. The device can offer a lot of value for its deceptively low price, and you should not ignore it in your search, even if you’re on a more flexible budget. Its maximum range goes up to 450 yards, and the XL450 additionally offers 6x zoom for extra precision in pinpointing your target. Precision is good for measurements in 1-yard increments, and the device offers quick and easy readjustments of the target as well. You shouldn’t have any problem quickly switching from one flag to another if you need to, and the intuitive interface means that it’s very easy to just pick up the Halo XL450 and use it straight away. In fact, it’s one of the best rangefinders on the market as far as intuitiveness goes, and it offers additional assistance in locating your target through advanced software features. It’s capable of compensating for slopes, for example – something lacking in even some higher-priced models. On top of all that, it’s made from durable materials and comes in a waterproof body, so you should be able to use it under any kinds of harsh conditions on your golfing trips. Just make sure you read the manual carefully first, and always use the device within reasonable limits and as outlined by the manufacturer. Still, they offer a pretty good deal on their warranty as well, so you shouldn’t have to worry that much about breaking your Halo XL450 too soon. Even if you already have a primary rangefinder and you’re satisfied with it, this can be a great addition to your golfing bag and thanks to the lightweight and portable design of the model, you won’t even know it’s there. But one day you will need to use it, and you’ll be thankful you packed it.